Maxthon is a browser that arises as an excellent alternative to the more famous as Internet Explorer, Mozilla Firefox, Opera and Google Chrome. Download the free Maxthon and check. The browser has versions for Windows, Mac, Android, iOS and Windows Phone. This browser is available in 26 languages​​, presents a fast performance and useful resources for both the entertainment, work and studies. Maxthon, which earlier was known as My IE2, there is already a certain time in the market and currently is in its third version. It is based on the Internet Explorer engine, with an efficiency very close to the Microsoft product. Yet it differs by having greater variety of resources. Some of the main features of Maxthon is based on pipes navigation commands by mouse gestures, drag feature, ad blocking and malicious pop-ups, reading mode, support bar of Google tools, customizing the look with skins, privacy features, plus plug-ins and a bar utilities with many features. Two features that stand out are: the ability to navigate in Split Screen mode and the two rendering modes of sites, Ultra and Retro. The Ultra mode uses the Webkit engine to render responsive, ensuring the fastest shipping in newer or upgraded to current standards sites. 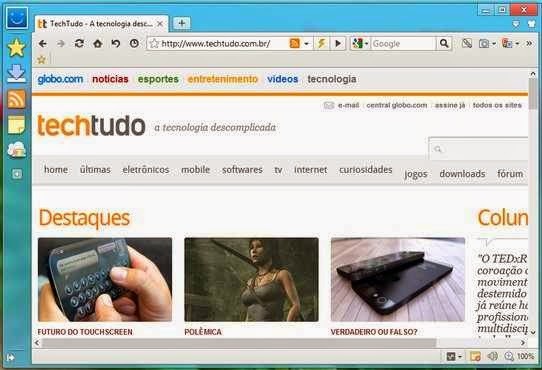 The Retro mode uses the Trident, the Internet Explorer engine, which is capable of dealing with ancient sites or those optimized for the Microsoft browser. This mode prevents bloquios on pages that run only certain functions in Internet Explorer. The use of these modes is very dynamic. To switch between the two modes, simply click the link that is next to the address bar. So when high speed is required, just click the Ultra mode, and when you need to use a unique feature of IE just switch to Retro mode. The Full Screen, Mute and Zoom functions are not innovative, but are very useful. With the mute can mute the sites and the Zoom can zoom or decrease the displayed pages. The Full Screen displays the browser in full screen. The Split Screen noteworthy since it is possible to split the browser into two, with two different sites at the same time. The pages appear in the same window and can be opened multiple tabs in each. Like in Google Chrome, Maxthon is also possible to use the address bar to perform searches on Google. A search bar is also available. Here the user can choose a specific search engine or choose the "Multi Search" option, which allows parallel searches in various search engines. The results are arranged separately from the preferred search engines and some specific groups which contain results for images, news, shopping, downloads, MP3, books etc..
Another very interesting option is the ability to search terms or drag images detached from one page to the address bar or search. You can also click on images and drag them to a folder, downloading. The Read Mode is a feature geared to optimize the reading on the internet and does not work on all sites, but most. Works especially in news pages. When compatible with the site, its icon appears in the right corner of the address bar. To activate it just click it is automatically open a page on the original with a very clean design and focused on the text, leaving it as readable as possible. No "visual pollution". With Feed Reader is possible to gather all content by RSS feed, arrange them between read and unread items, and even share them. The adhunter and Private Browsing mode are two features privacy and security very practical, which go beyond the constant updates of software to cover most vulnerable areas to attack. The first block any malicious ads and pop-ups before they load. You can configure the display rules of such content. The user can hide any element on a page or create a rule for loading content acting in general. The Private Browsing eliminates navigation data user on request or as soon as the user closes the browser. This option can also be programmed. The browser also has a system for checking sites, indicating whether they are safe or not. The indication is displayed by a green shield symbol in the address bar at the top left. By clicking it, you can see which security features page provides, as data encryption etc.. In Maxthon there is the option of creating account for different users browser. Thus, you can set up your account security aspects, plug-ins, applications, bookmarks, skins and visual completely customized, including the creation of an avatar. In addition, your navigation data are tied to your account, protected by login and password. The External Tools is a tool that allows the addition of resources from outside the browser, such as Windows Calculator or Notepad. The Pop-up Video detects the existence of a video on accessed site and provides options to assist you in a separate pop-up window or download it and watch later. The Download Sniffer automatically detects content that can be downloaded from the site where the user is. To obtain the file, just click on the tool icon and choose what to download. With the Easy Screen Grabs users are able to capture images of the entire screen or selected regions. With Maxthon Passport, which is the user account created through the registration and customization of avatar, you can access your data and navigation settings on another computer that has the same version of the program installed. If you have more than one account in the browser, they can all be accessed simultaneously. Reduce The Tiresome Typing creates shortcuts of the most visited websites by users through Maxthon. The History Calendar function organizes your browsing history in a daily and easy way to get your bearings and see. For complete information, just click on the desired day. What accelerates the recovery or disposal of any specific data navigation. To facilitate the accessibility and further streamline navigation, gesture commands are included with the mouse. You can pre-define them and hit all the setting as preference. Certain commands are already established and to trigger them, you must push the right mouse button and trace the shape corresponding to the command. The browser offers a reasonable range of interesting extensions that can be downloaded from your "Extension Center" as a translator of pages Google Translator or a converter from HTML to PDF.